Community Spotlight Week 17 WINNER! Welcome to Toluna’s weekly community spotlight feature*. If some of you are unfamiliar with what the ‘Community Spotlight’ feature is please have a look at our previous blog post providing you with all the information of how it works as well as how you can involved with our weekly feature to win some extra points. If you want to find out the results and participate in the poll, click here! 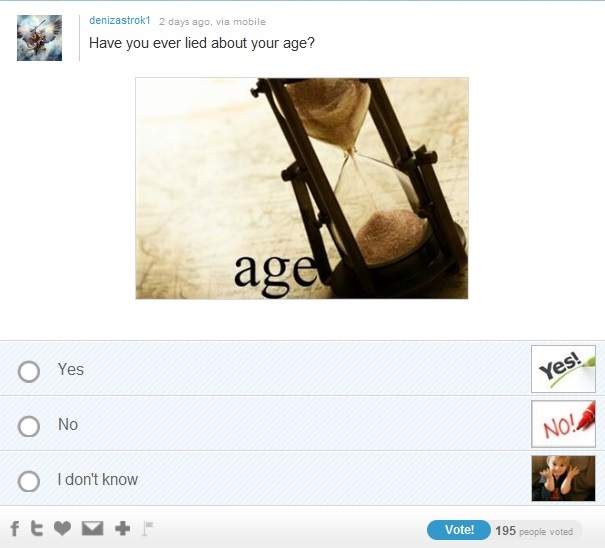 Have you ever lied about your age or have you been honest! We would to hear your opinion. If you want to get involved and win 5,000 points for the content you create, please leave your links for us to have a look at. Next week’s winner will be announced on Wednesday 22nd January 2014. *As a reminder, each week, the Toluna team searches the site for the weeks most popular or intriguing member content, and will share that information with the community, right here on our blog. The “Featured User” we select will get a special 5,000 point bonus applied to their account for providing us with our weekly spotlight. To be considered for next week’s community spotlight, post a link to your poll, opinion, thumb it or battle on the TolunaTeam topic here. If selected, we will contact you via email, and will post a message on your Wall so all of your followers and friends will know that you are a Featured Toluna User. For more information about Community Spotlight click this link.